That famous torch, the one claimed by John F. Kennedy on a frozen day in 1961 and carried in Democratic Party ups and downs by Kennedys ever since, was finally passed here on Monday, in an emotional opening to the party's convention designed to define the man on the receiving end. 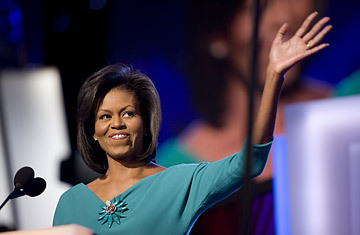 A parade of Barack Obama's friends, colleagues, and family members  culminating with his wife Michelle  delivered speech after speech on a single theme. Forget the "funny name," as Michelle Obama assured a prime-time audience. The first African-American nominated by a major party, the son of a single mother raised in the islands of Hawaii and Indonesia, is not so exotic after all  his is "the great American story." "It's the story of men and women gathered in churches and union halls, in town squares and high-school gyms," she continued, exuding poise. The point of her husband's campaign, she said, is "reminding us how much we share and how alike we really are." Some 15,000 people jammed the Pepsi Center in downtown Denver for the first day of the four-day Democratic Convention. Outside, the gathering was shadowed by signs of division in the party, including two new polls indicating that a significant number of voters who backed Hillary Clinton in the primaries  perhaps one-in-four  have migrated to support Republican John McCain. But inside, the Obama campaign was firmly in control, running a well-organized program intended to coax those voters back to the Democratic fold. How? First by wrapping the candidate in the folds of party history. That effort produced one of the evening's most dramatic moments, when Senator Edward M. Kennedy, battling brain cancer, shrugged off the fears of his doctors and his wife to deliver a brief, passionate speech. "Nothing, nothing is going to keep me away from this special gathering tonight," said the aging keeper of the family flame  the family whose bright promise and calls to action have stamped the Democratic Party with a sort of nostalgic longing for almost half a century. The slight cracks in Kennedy's booming brass voice, and the realization that this may well be the last of at least ten Ted Kennedy speeches to these gatherings, lent a undeniable poignance to his declaration that: "For me, this is a season of hope. This November the torch will be passed again to a new generation of Americans." And then, echoing perhaps his most famous speech, the one delivered in 1980 after his own presidential hopes fell short, he concluded: "The work begins anew, the hope rises again, and the dream lives on!" But that still left the task of reintroducing Obama to the American public. His primary campaign was the longest in history, but still, he's a sudden arrival on the national stage. Four years ago at this event, he erupted from obscurity with his powerful keynote address. Judging from opinion surveys, that's not long enough for Americans to feel they know a guy. "There are two questions that people have in politics," Massachusetts Rep. Ed Markey shouted as he made his way slowly across the thronged convention floor. "First, is he one of us?" The purpose of the convention, he explained, is to answer question number one. So there was a speech from Jesse Jackson Jr., another Illinois pol, who testified that "I know Barack Obama. I've seen his leadership at work. I've seen the difference he has made in the lives of people across Illinois." And there was a speech from Michael Fisher, a machinist from Indiana, who met Obama on the campaign trail and determined that "Barack is the real deal." And after his wife's speech, Obama appeared on a giant monitor over the stage from a supporter's living room in Kansas City. A giant smiling husband and dad wishing his daughters Malia, 10, and Sasha, 7, sweet dreams. Phrases like "one of us," and "just like you" reverberated through the hall. "I think," Ed Markey shouted, "by Thursday he will have shown the country that he's one of us." Those pre-convention polls also found that the race between Obama and Republican John McCain appears to be tied, dead-even, neck-and-neck. Which means that Monday really was the opening of a whole new race. After all this time, Obama and McCain are side by side at the starting line. Two men, with equal backing, ready to fire out of their conventions into the final 10-week sprint. McCain's name was mentioned now and then on Monday, almost always in conjunction with the unpopular President Bush. But the sharply aggressive tone promised  even demanded  by some Democrats never really materialized. And that brings us, at last, to the second of Ed Markey's questions. Is he one of us, and is he qualified? That's the one that can't be answered without a direct comparison to his opponent. And the longer Obama has to spend on question one, the less time he has for question two.